This page is dedicated to the life of Sao Tong Jan. She is a beautiful baby female elephant and in English her name means ‘Golden Moon’. She was born on 14th February, 2005 and we hope she has a long and wonderful life ahead of her. Tong Jan is growing up to be a beautiful female elephant. she is a popular elephant with old and young elephants and visitors to the park. She will never know a life of hard work like her mother and can continue to grow and develop in freedom and peace. Currently there are four calves at the Park under the age of two years, but it is Tong Jan, the oldest of the group, that is the sensational star of the Park. Confident, gregarious, playful and highly intelligent – watching Tong Jan has given hours of pleasure to thousands of people. Part of Tong Jan?s confidence comes from having a strong, stable and supportive family group to watch over and protect her. Her mother, Bua Tong has the support of Thai, Som Boon, Mae Elu and Mae Khamsai who all take a role in caring for Tong Jan and Mae Khamsai’s calf, Aura. Aura is a few months younger than Tong Jan but having another calf of a similar age to play, interact and learn with has almost certainly had a very positive effect on the development of both elephants. The two elephants and their families follow a regular and unchallenging daily regime. In the mornings they are free to wander within the confines of the Park and much of the time is spent grazing in the long grass. In the late morning, they are encouraged to move to the central park viewing platform where they socialise with the other elephants under the gaze of Park visitors. Tong Jan is a very confident around the adult elephants; she seems to enjoy socialising and particularly likes to rub against Max if he is around. Tong Jan has begun eating solid food although she mainly confines herself to the softer. Unlike the adult elephants, she generally has bananas peeled for her although if there is no alternative she won?t let a bit of skin get in her way! After lunch, Tong Jan joins the rest of the family in the river for a bath. She enjoys the water and plays with her best friend Aura and has just started to gain confidence in playing with the adult elephants. Playing in the river allows her to expend some of her excess energy without getting into too much trouble.. When they come out of the water, the family will usually enjoy an extended period of scratching and dusting. This appears to be Tong Jan?s favourite part of the day. Her and Aura roll and frolic in the sand, climb atop one another and rub themselves against a couple of fallen trees by the riverbank. The session generally ends with a good dusting of sand. After an afternoon?s grazing, Tong Jan begins her training lessons with her mahout. For the safety of visitors to the Park, it is important that the calves are taught some simple commands. The training is done solely by methods of positive reinforcement using praise and food as a reward. Tong Jan, with her keen intelligence, has shown an exceptional aptitude for the training and is a very quick learner. The conclusion of the training sessions ends a very long day for young Tong Jan and she rejoins her family for the night. Two of the other elephants have joined Bau Tong and Tong Jan and became part of their immediate family. Elephant calfs have ‘aunties’ and Thai and Som Boon have taken on this role. They help in lcaring for the young elephant and may well retain this role for many years. They always keep an eye on Tong Jan making sure she never strays too far and keeps out of trouble. 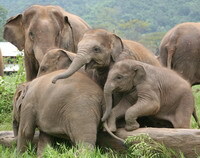 If they ever percieve a threat to her they all huddle round, protecting her and trumpeting loudly warn off any danger. Not that there is much to threaten at the Park –the elephant were recently observered making a huge commotion as they attempted to protect Tong Jan from a passing ice cream man on his motorbike! Tong Jan was instantly curious about her new home. During the first night she kept wandering off to explore. Her Mae Bua Tong got quite worried and she nearly knocked down their shelter. The next day many other elephants came to see Tong Jan and they made a real fuss of her. They all gathered around and felt her all over with their trunks. They groaned and squealed with delight at having a new baby in their herd. It did not take long before Tong Jan settled into life at the Park. She spent the day browsing freely with her mother going wherever they chose. Soon Tong Jan got to know the other young elephants – Hope and Jungle Boy were only a few years older. They taught Tong Jan how to play in the river and have fun by chasing a football. Luckily Tong Jan and her mother were discovered by Lek who is famous for rescuing elephants in trouble and giving them new lives in her Elephant Nature Park. 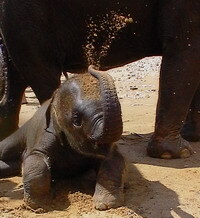 The Park is located in Mae Taeng in Thailand in a beautiful valley with a river where the elephants can bathe and play. When she found the sick mother and baby elephant, Lek asked EleAid if we could help. EleAid was only able to rescue the two elephants thanks to enormous contributions from the Daniels family of London. The whole family gave exceptionally generous donations and Olivia Daniels, whom we met in Thailand, sacrificed her 21st birthday present opting to put the money to saving these two wonderful elephants rather than have a gift for herself. On 1st July 2005 Olivia was with Lek and the two elephants when they left the tourist camp for the last time. It was only a three mile walk and they arrived at the Park just before sunset. Tong Jan’s mother is another EleAid elephant named Mae Bua Tong. For many year she worked in a tourist elephant camp, a difficult job carry tourists in a heavy chair on her back. After Tong Jan was born on Valentines Day 2005, her mother was only allowed to rest for three months and then she was put back to work. For up to six hours a day she was forced to give tourist rides in the mountains while poor old Tong Jan had to struggle alongside trying to keep up. Tong Jan was so young that she was still entirely dependent on her mother’s milk for food. She never got enough to drink because of the long hours her mother was working and very quickly the health of both mother and baby began to suffer. They both started to get ill.